The analyses below summarize where Health Technology innovations are occurring. The above map shows the number of Health tech companies located in different countries. The United States ranks as the top country with over 1,000 companies. 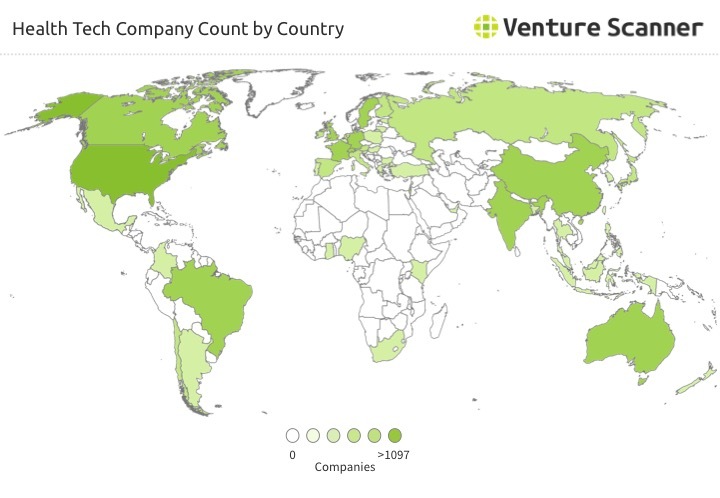 The above map shows the amount of total Health Tech startup venture capital funding in different countries. The United States has the most VC funding at around $26B. We are currently tracking 1,579 Health Tech companies in 22 categories across 52 countries, with a total of $33B in funding. Click here to learn more about the full Health Technology landscape report and database. 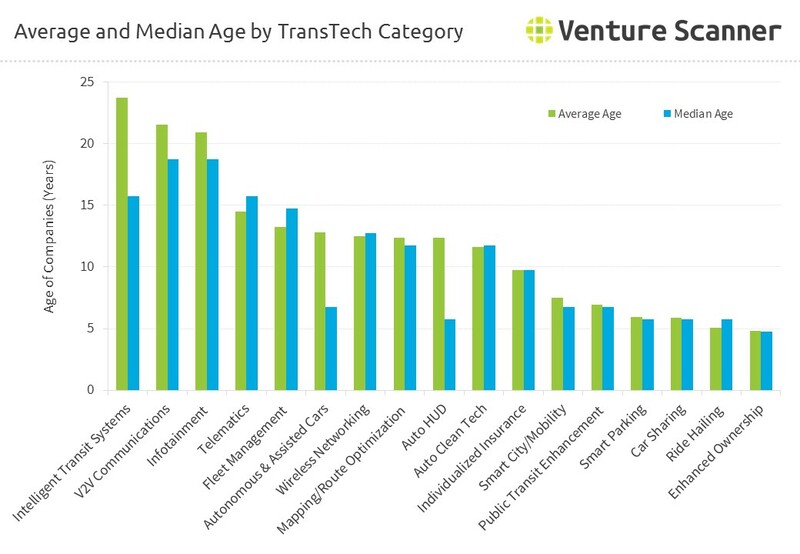 The above graph summarizes the average age and median age of companies in each Transportation Technology category. The Intelligent Transit Systems category has the highest average age at around 24 years, followed by the V2V Communications category with an average age of 22 years. V2V Communications and Infotainment categories have the highest median age at 19 years, followed by Intelligent Transit Systems and Telematics categories with a median age of 16 years. We are currently tracking 998 Transportation Technology companies in 17 categories across 64 countries, with a total of $47.6 Billion in funding. Click here to learn more about the full Transportation Technology landscape report and database. 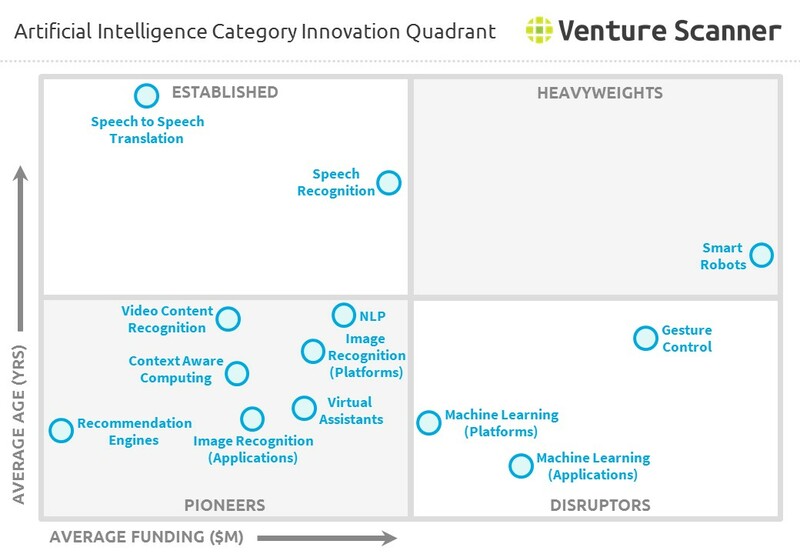 Our Innovation Quadrant provides a snapshot of the average funding and average age for the different Artificial Intelligence categories and how they compare with one another. • Heavyweights: Categories with high average funding and high average age. These categories are comprised of companies that have reached maturity with significant financing. • Established: Categories with low average funding and high average age. These categories are comprised of companies that have reached maturity with less financing. • Disruptors: Categories with high average funding and low average age. These categories are comprised of companies that are less mature with significant financing. • Pioneers: Categories with low average funding and low average age. These categories are comprised of companies that are less mature with earlier stages of financing. 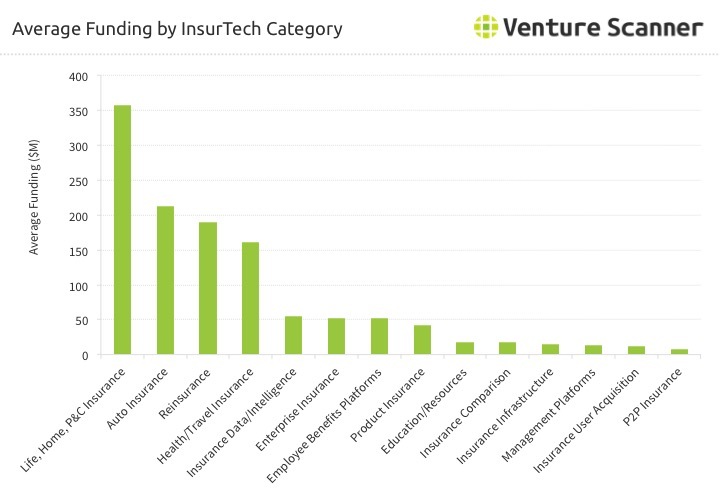 The above analysis summarizes the average company funding in each Insurance Technology category. The Life, Home, and P&C category leads the sector with around $350M in average funding per company, followed by the Auto Insurance category with just over $200M in average funding per company. We are currently tracking 1,010 Insurance Technology companies in 14 categories across 53 countries, with a total of $16.7 Billion in funding. Click here to learn more about the full Insurance Technology landscape report and database. 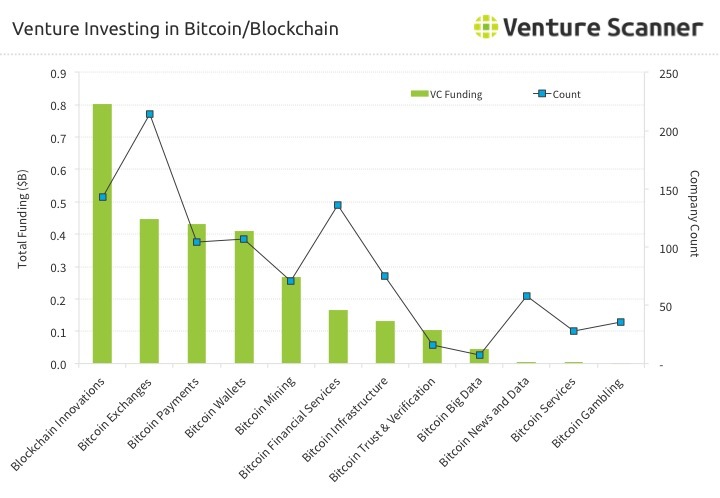 The above graph compares the total venture funding in each Bitcoin and Blockchain category to the number of companies in the category. Blockchain Innovation category leads the sector in the Total Funding stat with around $800M in funding. The Bitcoin Exchanges category leads in the Company Count stat over 200 companies. We are currently tracking 888 Bitcoin and Blockchain companies in 12 categories across 74 countries, with a total of $1.85 Billion in funding. Click here to learn more about the full Bitcoin and Blockchain report and database. 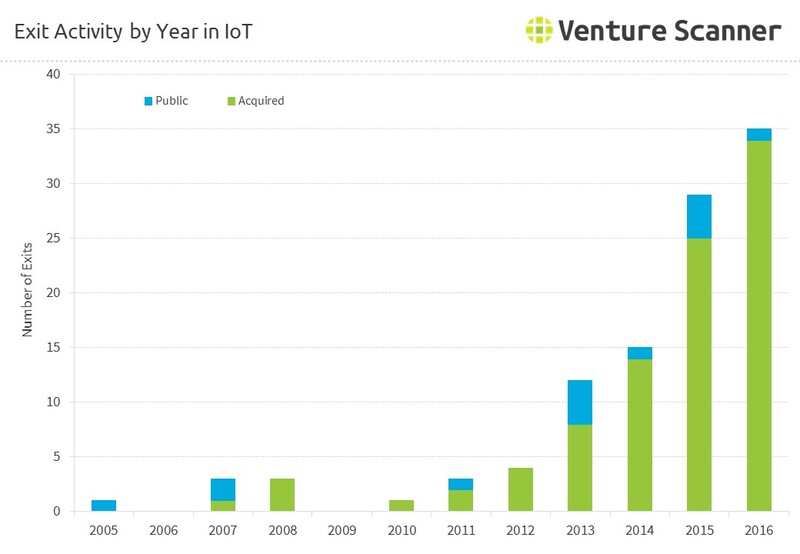 We are currently tracking 1500 IoT companies in 20 categories across 46 countries, with a total of $25.5 Billion in funding. 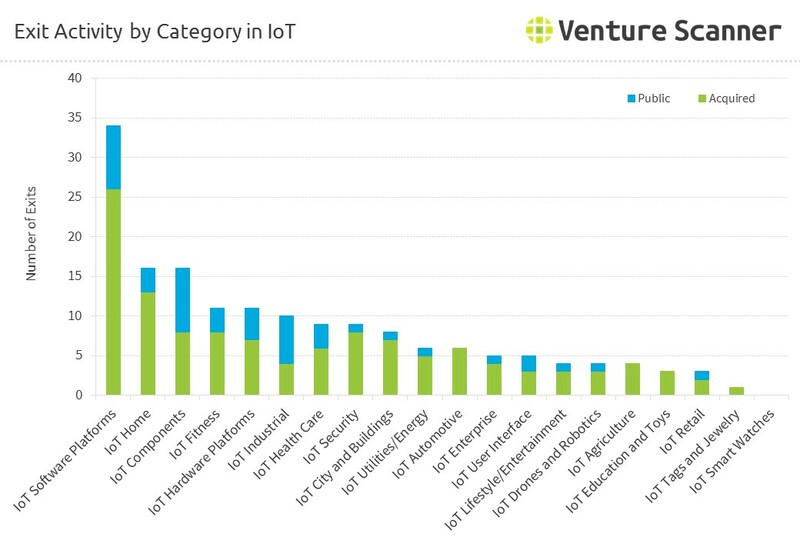 Click here to learn more about the full IoT landscape report and database. 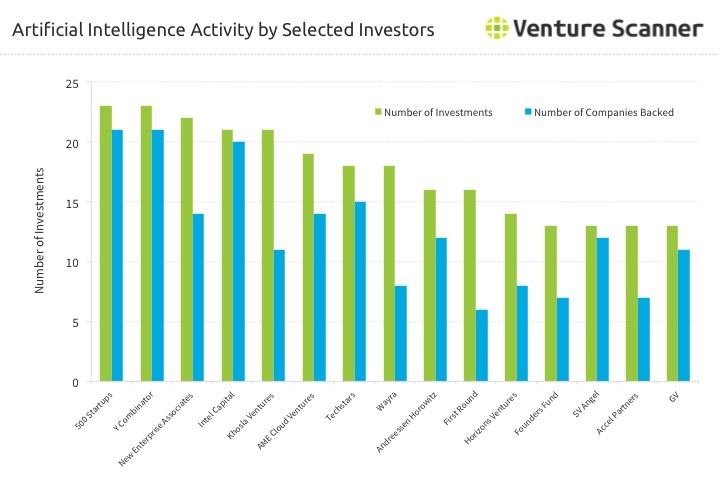 The above analysis summarizes the total number of investment rounds Artificial Intelligence investors participated in, and the number of unique AI companies funded by selected investors. 500 Startups and Y Combinator take the lead in both categories, both making the highest number of investments and backing the most AI companies. We are currently tracking 1,494 Artificial Intelligence companies in 13 categories across 73 countries, with a total of $9 Billion in funding. Click here to learn more about the full Artificial Intelligence landscape report and database. The following two graphs summarize the types of funding going into the Financial Technology space. 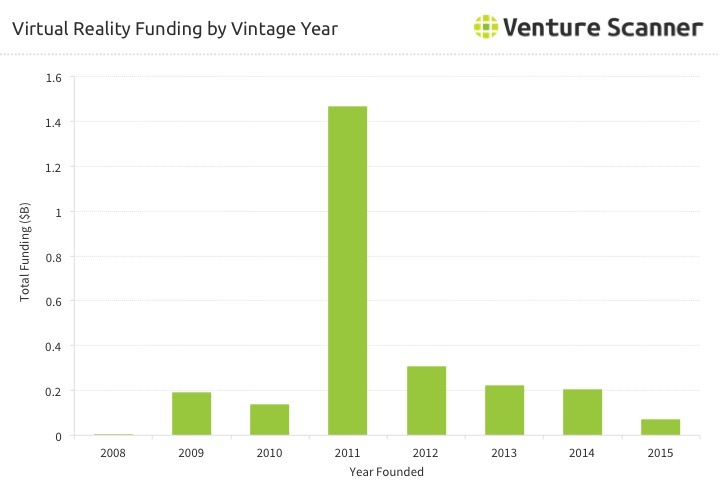 The graph above shows the total amount of VC funding broken out by type. 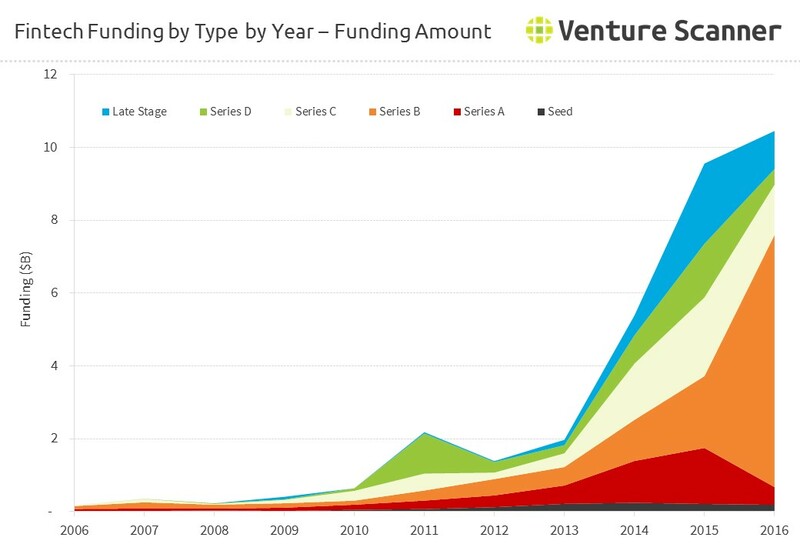 In 2016, Series B funding has accounted for a substantial amount of total funding, with Series C and Late Stage funding coming in at second. In 2015, all types of VC funding accounted for approximately the same amount, with the exception of Seed funding. 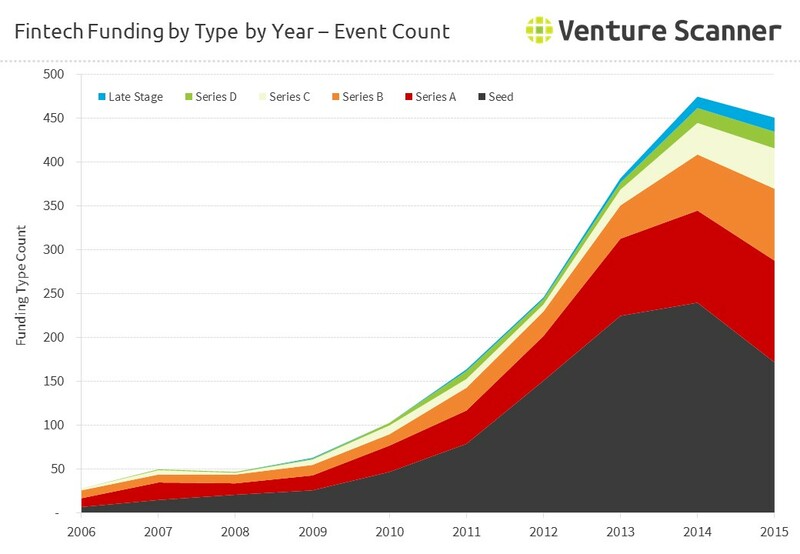 The graph above shows the total count of funding events broken out by type. The general trend over the past few years has been a larger number of early stage funding events, such as Seed, Series A, and Series B funding events--and a diminishing number of events in the later stages. We are currently tracking 1990 Financial Technology companies in 16 categories across 59 countries, with a total of $54.6 Billion in funding. 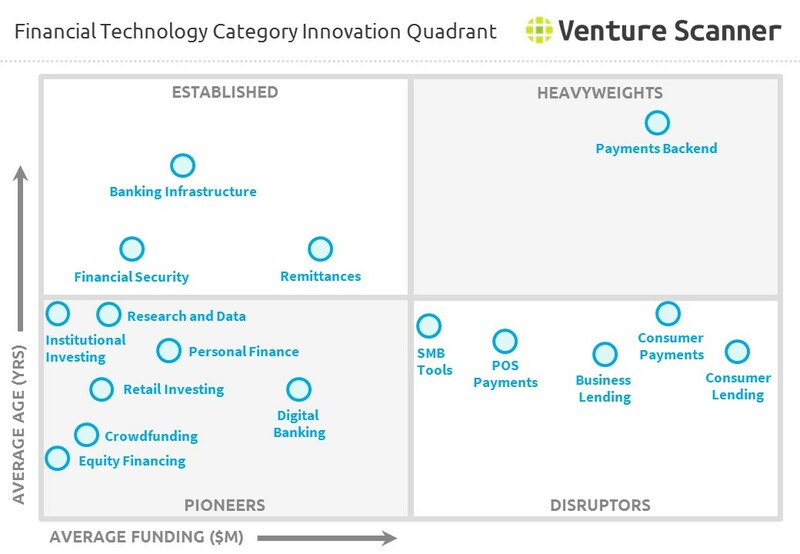 Click here to learn more about the full Financial Technology landscape report and database. 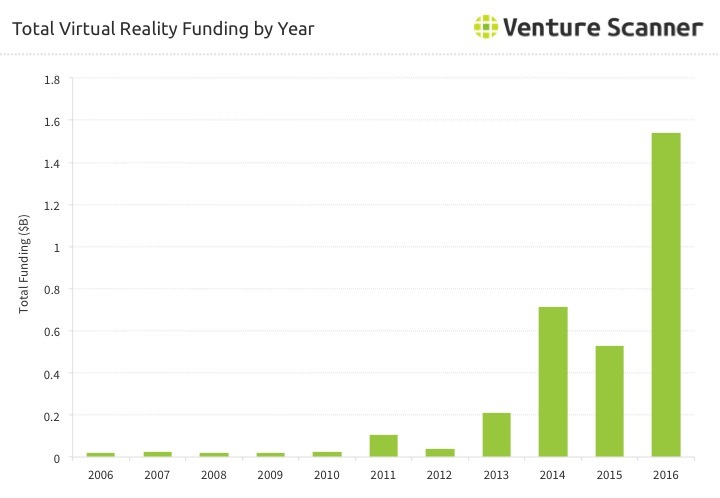 The above graph summarizes the total funding raised by Virtual Reality startups for each year. 2016 is the best year so far with almost $1.6B raised to date. 2014 comes in at second place with almost $0.8B raised. The above graph summarizes the total amount of funding raised by Virtual Reality companies founded in a certain year. VR companies founded in 2011 have raised the most funding at around $1.4B, followed by those founded in 2012 which have raised about $0.3B. We are currently tracking 564 Virtual Reality companies in 13 categories across 43 countries, with a total of $3.46 Billion in funding. Click here to learn more about the full Virtual Reality landscape report and database.